A law firm has a responsibility to not only represent their clients in a just way, but also to manage their clients’ advances/deposits for court fees, fines and other potential payments. Interest on Lawyers Trust Account (IOLTA) is an account in which lawyers hold funds that do not belong to the lawyer right now or are disputed. Without taxing the public, and at no cost to lawyers or their clients, interest from IOLTA is pooled to provide civil legal aid to the poor and support improvements to the justice system. Due to the timing and sensitivity of lawsuits, a client’s funds are held in escrow by their attorney and are protected in a special type of bank account, called an IOLTA. While these separated funds are maintained in the name of the law firm, the IOLTA is managed by the state and interest accumulated is due back to the client. 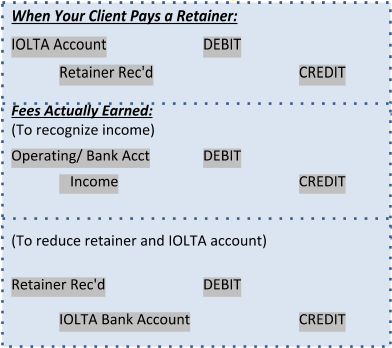 Why Should Lawyers Place Retainer Funds Into an IOLTA? Not only does the bar association have rules for reporting IOLTAs, there are also mandates on keeping a detailed balance sheet for each individual client’s deposits and disbursements. If lawyers don’t properly track these items, the ethics board can cite a violation and even revoke an attorney’s law license. Protect Your Livelihood and Your Law Firm! Having trouble keeping track of your clients’ retainers and detailed balance sheets? If you need any help with bookkeeping for IOLTAs, we recommend attorneys reach out to their accountant, a law practice management consulting firm or a knowledgeable, qualified bookkeeper like BudgetEase.